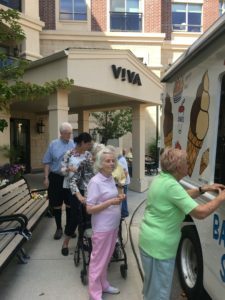 To celebrate the end of the summer, our Community enjoyed complimentary ice cream, and an amazing performance by professional magician, Dan Kranstz. He bent a fork before our eyes without touching it, and was able to predict a randomly selected phone number with the help of seven of our Team Members, just to name a few tricks up his sleeve! Needless to say, we were more than entertained as we enjoyed this special time together.